And now for part two! 1. If I could be in any infomercial, I would pick Lomography Cameras because: I think that what they do for photography as an art form and as a hobby is pretty revolutionary and cool. 2. If I could be any character from a movie, I would be Kate from French Kiss because: she lost everything and then found happiness unexpectedly. Also, she gets to live in a little stone cottage in the South of France. Does it get better than that? 3. If my life story was to be written as a novel, the title would be: Camera in Purse, Coffee in Hand; the story of an adventure. 4. I always wanted to be: a journalist. 5. If I can only give my children one piece of advice, it would be: Find your passion, or at least a hobby that you care about, and make sure you give yourself time for it frequently. 6. Three things I want very badly at the moment are: Sleep. Infinite riches. Weekend. 7. What is your process for creating layouts when you receive your Label Tulip kit? Do you start with photos, paper, a sketch, or something else? I usually have a sketch or two in mind, then I look at the photos I have and think of what would coordinate best with the products. And then I figure out what story I want to tell. One of my favorites! It just really came together easily and I love the composition. And now, on with the Label stuff! It's time to get hybrid! Here is a link to a PDF file of digital images I have designed with a Summer theme in mind. I made a layout to start with, using elements from the download as well as some of the canvas labels created in the first tutorial. So are you ready for a challenge? 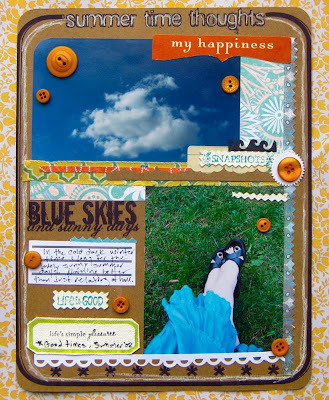 I challenge you to make some sort of artful project using the digital freebie I've created. 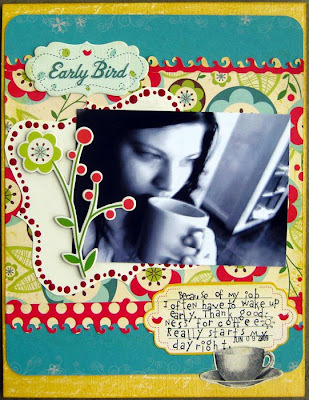 Pages, cards, ATCs, altered stuff, whatever it is that you make, I wanna see it! Please be sure to link your work either to the comments on this post or on the "Day 7- Label Projects" thread in the "Challenges" board. Don't forget that you can upload these projects to our Label Tulip Member’s Gallery as well. You know you want this! Look at the Thickers, and the stickers and all the rest of those goodies. Excellent. Well my lovelies, that's all for now. Cannot wait to see what you come up with! Awesome pdf file you have created! I love it!! super cool tutorial too! I need to break out my paints more often! i used the blue skies quote...it fit perfectly with my photo! That pdf is FAB! And what a lovely prize! I'm going to have to try to do something to win this! Love the canvas tags and tutorial, thanks for the inspiration! Great tutorial and I lOVE the freebies. Cool design! I'll definately try to make something with them.. I love your layout! I love how you pulled the products together. i love this line and I may just have to do it! Great pdf! I LOVE the freebies. I have to try to do something to win this! Here's my take on the challenge! Thanks a lot for the pdf !